This watercolor art project is an easy art project to do particularly in springtime (or indeed at any time). Students will find it easy to create sky backgrounds by combining blue and grey colors. The rainbow colors are easy to blend. They can add details with fine markers to a drawing, or they can paste on special shapes to a background painting. 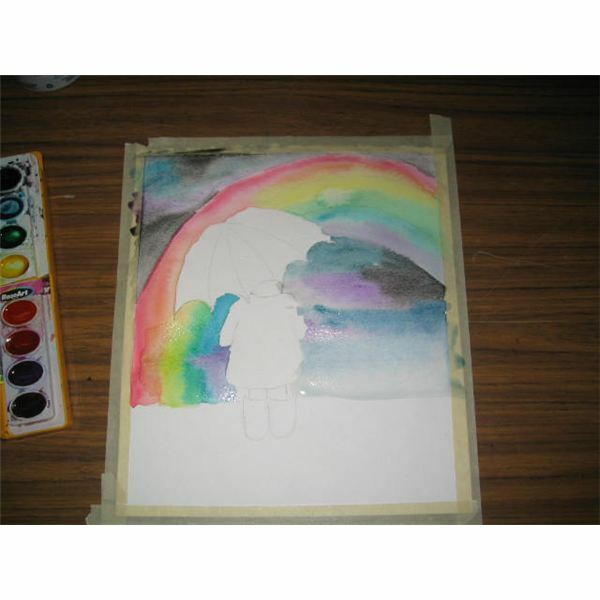 This is also a versatile watercolor project. The salt, rubbing alcohol, sponge squares and cut out shapes are optional. This can be done with or without special effects. 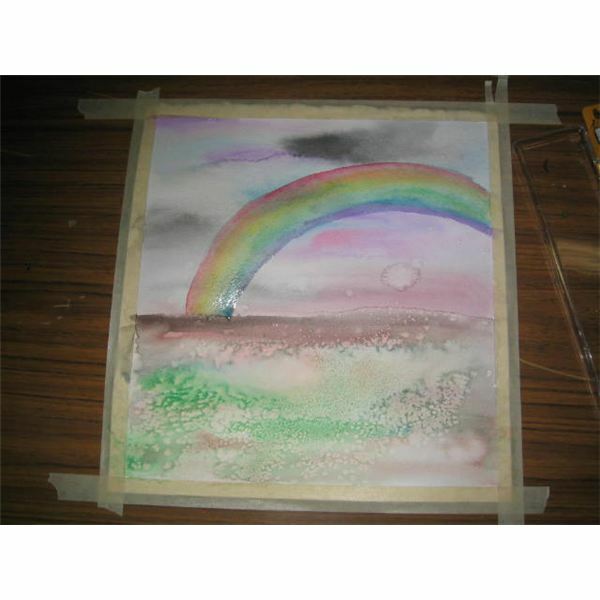 Using a pencil lightly draw a horizon line and a rainbow in the sky. If drawing an umbrella and person, also sketch this in. Younger grades may find it easier to paint the background separately. 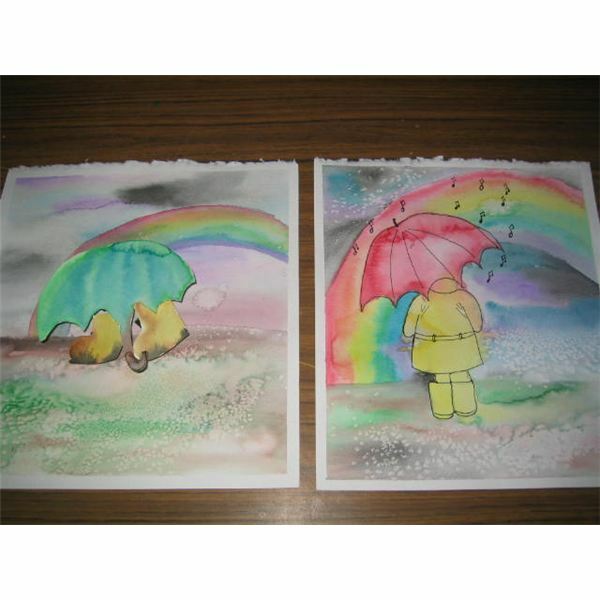 An umbrella and boots can be created separately on another watercolor sheet of paper, cut out, and attached with glue on sponge squares to mount. The rainbow can have 3 to 7 sections in it. Wet each section of rainbow separately with clean water. Add one color to each section starting with red, orange, yellow, green, blue, indigo, and violet. Each color should touch the next so they bleed into each other. You can just add the primary colors, red, yellow and blue and have the colors blend into each other to form orange, green and purple. Use this to teach about primary and secondary colors. Apply a watercolor wash in the background. 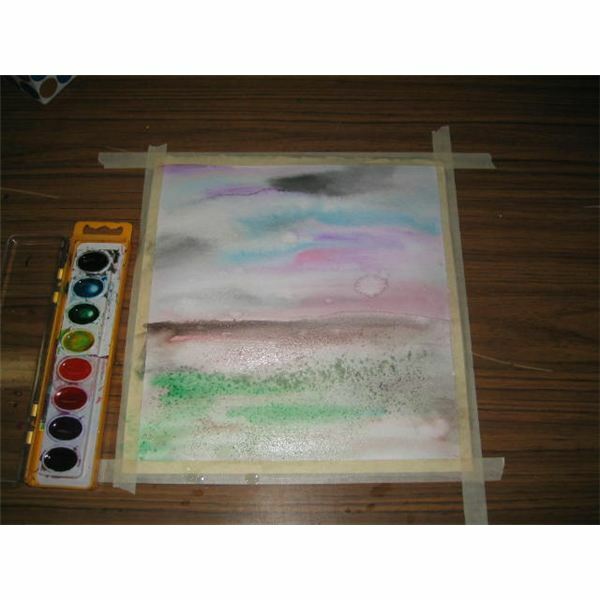 Use blacks, greys, blues, purples and cool colors for a stormy sky. The more watery the paint applied, the lighter the color. The ground can be painted browns and greens. Apply a few drops of rubbing alcohol onto the ground with a fine brush. This is good for a rocky surface. Apply table salt to the ground and sky areas for a special effect. 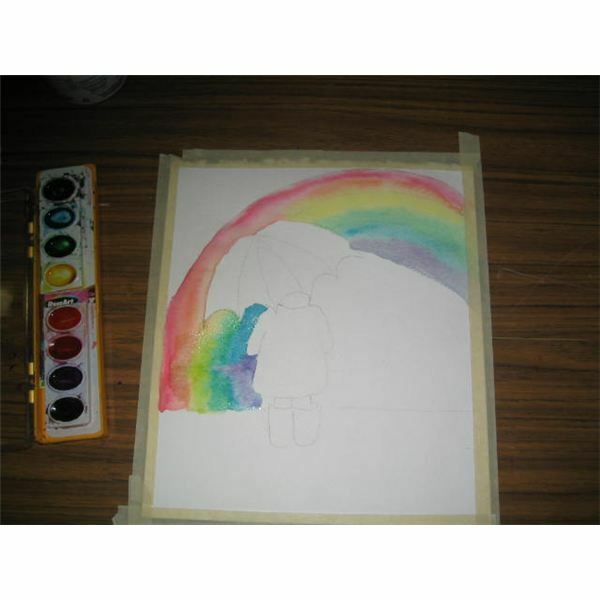 Apply one or two colors to the umbrella. Use a darker color around the edge and fill with a lighter color or the same color in a lighter, watered down shade. Fill in the coat and boots in yellow. 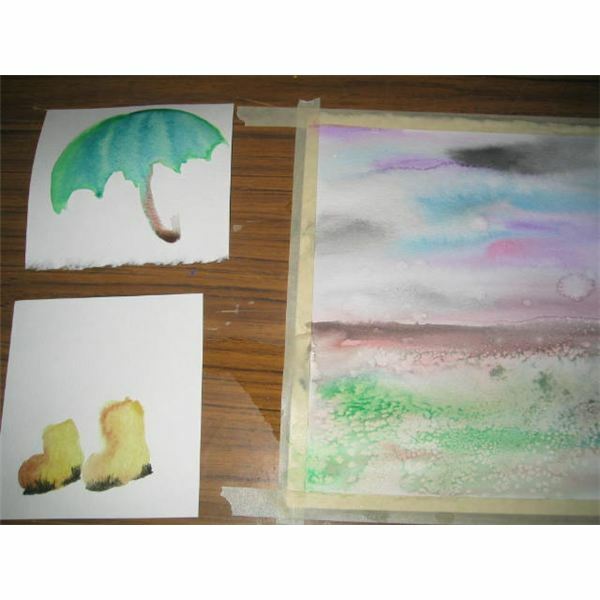 If painting on a separate piece of paper, paint the umbrella with a small handle and paint 2 separate boots. You can add brown or black color to the bottom of the boots. Let painting dry and wipe off salt if needed. 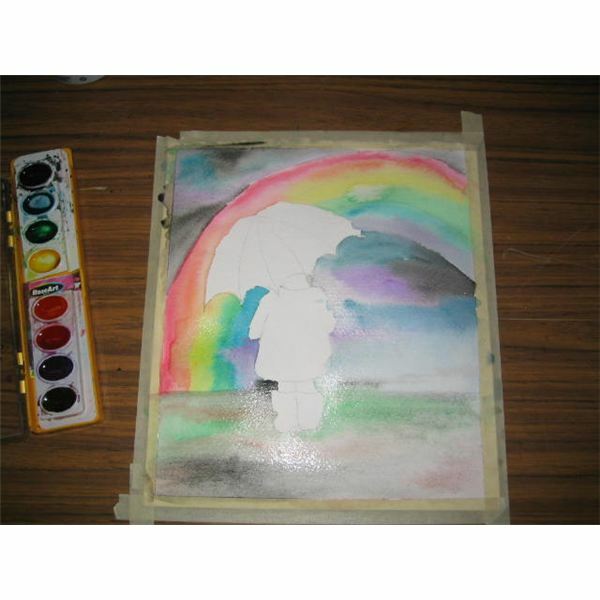 After the painting is dry, outline the umbrella and person with a sharpie marker. 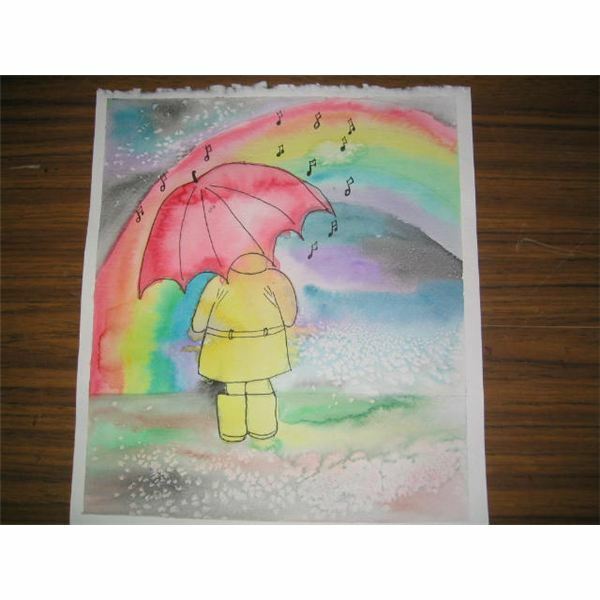 Special effects like musical notes or raindrops can be added. 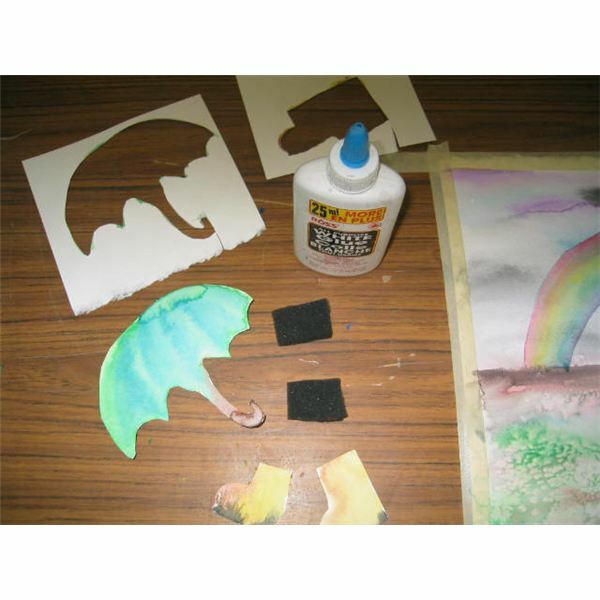 If the umbrella and boots are painted on separate paper, cut them out, add tacky glue to sponge squares to raise up. Have the boots stick out from under the umbrella. Outline them in marker for the students. Remove the tape border. Backgrounds and special effects can be achieved with table salt, pickling salt, sea salt and rubbing alcohol. The salt will soak up the paint and will look like raindrops. Add larger salt crystals to make a larger puddle or splash effect. The rubbing alcohol is added on the ground to make the surface look rough and to show puddles. Use small droplets from a small brush to apply. 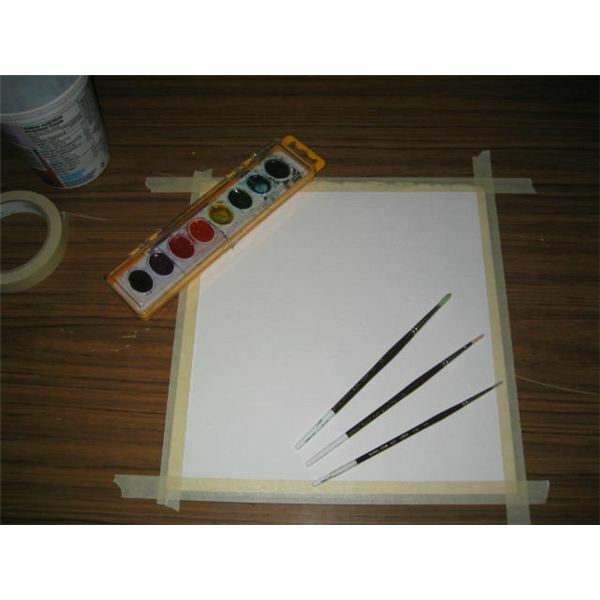 For watercolor paper, brushes and paint suggestions, see part 1 Hints and Tips of this series. Do not mix the colors in the paint box. The colors will blend on the paper. Make sure to cover all the white spaces on the paper. Add more water if the surface dries as you work. If using salt, keep a little container of salt on each table or near a group of students, so the paint does not dry out before salt is added. Pickling salt will produce more noticeable effects than table salt. Wipe salt off as soon as paint is dry so it does not stick to the paper. Use the lesson to teach the colors of the rainbow and their order. Students who want to use a different order other than red, orange, yellow, green, blue, indigo, violet, should be allowed to try it. The rainbow colors can be used on the umbrella. 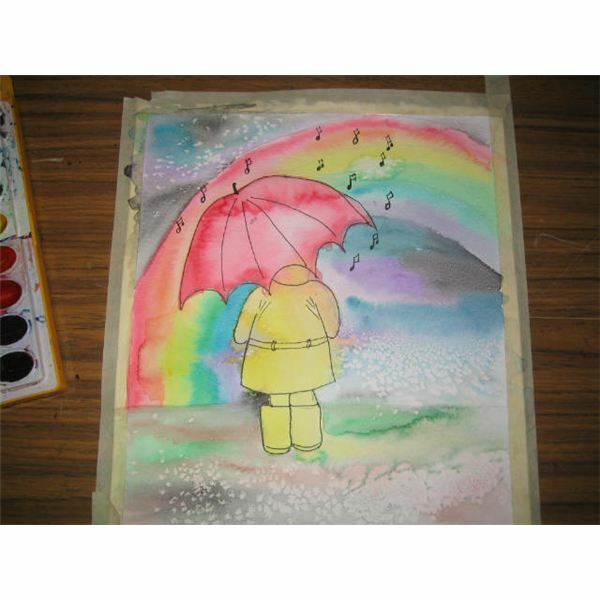 Use the lesson to teach about the song “Singing in the Rain" and teach how to draw musical notes. 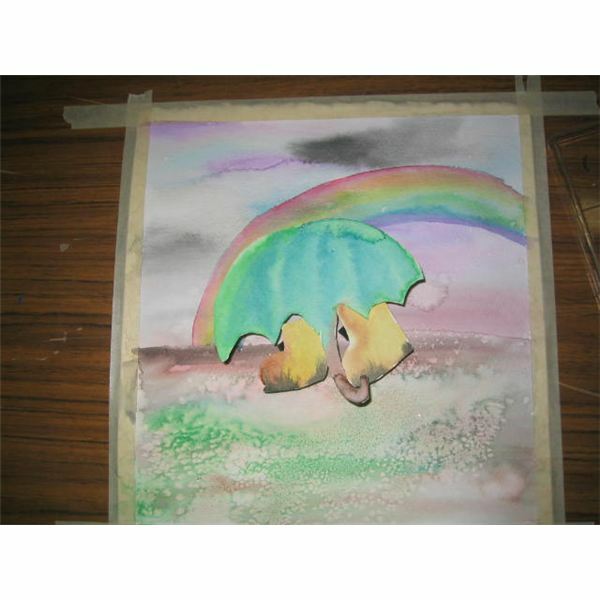 Use the lesson to teach about the symbol of the rainbow in the Bible as a covenant with Noah. Use the lesson to discuss warm colors (red, orange, and yellow) and cool colors (blue, indigo, violet). Discuss why meanings of colors such as green are a sign of spring. Discuss color descriptions such as "sunshine yellow" and why we describe feelings with color such as "feeling blue". 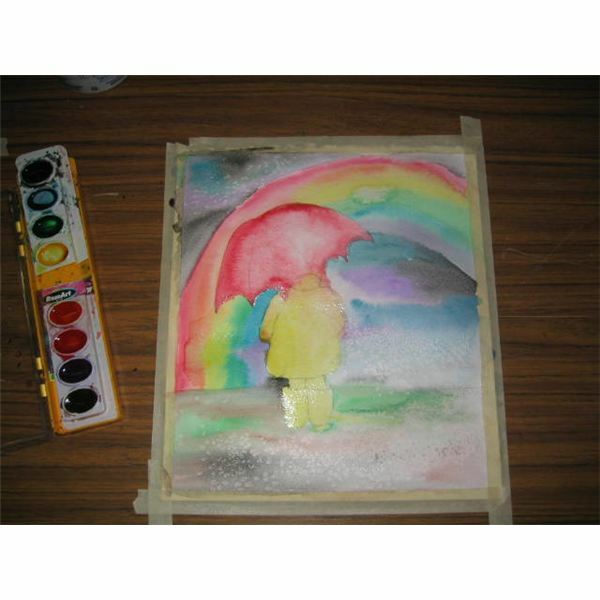 Children love to paint the colors of a rainbow so will find this a fun, and colorful watercolor project. 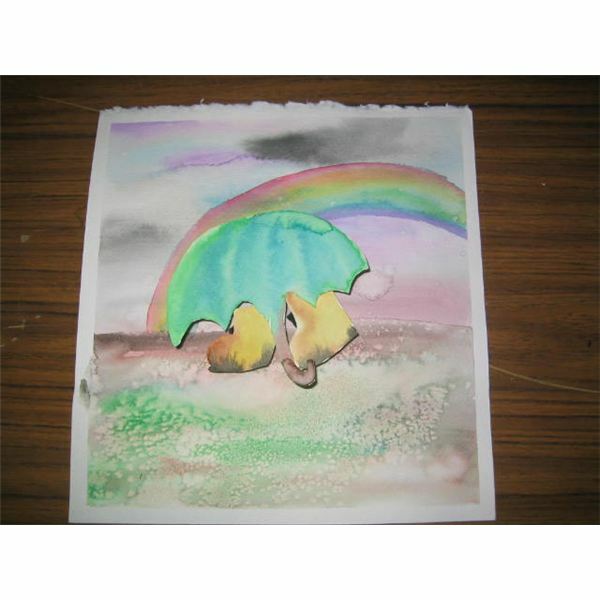 Watercolor art produces excellent results from blending the colors. Framing the art or displaying the variations in colors created is suggested.